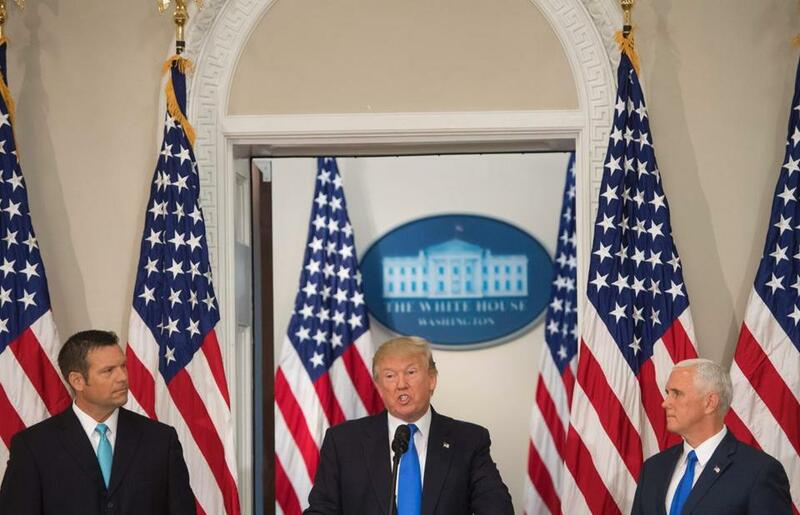 President Donald Trump spoke alongside Kansas Secretary of State Kris Kobach, left, and Vice President Mike Pence , right, during the first meeting of the Presidential Advisory Commission on Election Integrity. WASHINGTON — Shrugging off complaints about whether it is even necessary, President Trump’s commission on voter fraud doubled down when it met for the first time on Wednesday and asked its staff to look into assembling vast new caches of information on individuals. The commission indicated it wants to collect information already held by the federal government and tasked the staff with getting the Department of Homeland Security to turn over data on people applying for citizenship, since they must check off a box indicating whether they have registered to vote. The panel also discussed seeking information on people who have attempted to get out of jury duty by claiming to be noncitizens. The reason: Jury lists come from voter rolls, so noncitizens shouldn’t be on the list to begin with. Most experts say voter fraud is extremely rare in the United States, and the commission has already come under heavy criticism for trying to scoop up personal data on voters in every state. The panel, led by Vice President Mike Pence, is among the earliest examples of Trump’s translating his “us-against-them” political philosophy into governance: Most of its focus on Wednesday was about shoring up the country’s voting systems against what Trump perceives as domestic threats, even though there’s been no evidence of Americans engaging in widespread fraud. The president alleged large-scale voter fraud last fall, and he continued the charge on Wednesday. Previously, despite lacking any evidence and in defiance of most experts, he had made the claim to explain why he lost the popular vote to Hillary Clinton. Trump has in the past singled out Massachusetts as a state where large numbers of people committed fraud. He has accused Bay Staters of boarding buses to New Hampshire, which has same-day voter registration, and illegally casting ballots. Trump narrowly lost New Hampshire to Hillary Clinton in the general election. William “Bill” Gardner, New Hampshire’s secretary of state and a member of the commission, has said there was never any proof of massive irregularities in the state last year. Kris Kobach, Kansas secretary of state and vice chairman of the commission, echoed some of Trump’s concerns in a TV interview Wednesday. But Pence, during the commission meeting, tried to tamp down the widely held notion that the panel was formed purely to find evidence to support Trump’s claims. “This commission, let me be clear, this commission has no preconceived notions or preordained results,” Pence said. Even before its members convened on Wednesday, the panel had generated a huge amount of controversy. It’s already the subject of at least seven lawsuits by various groups, including one by the NAACP Legal Defense Fund, which alleges that its entire purpose is to find ways of discriminating against minorities. But by far the most controversial move was the commission’s attempt to gather voter-registration information, including names and Social Security numbers, from all 50 states. Forty-four states, including many led by Republicans, declined to provide at least some of the data requested, according to a CNN tally. Trump was annoyed by this broad rebuff on Wednesday. “If any state does not want to share this information, one has to wonder what they’re worried about,’’ he said to the panel. The panel was founded to “justify Trump’s fallacy about the election,” Galvin said. He’s worried the panel’s mission will morph into something more insidious: an effort to create national election standards aimed at excluding or intimidating swaths of the electorate. Data collection from the states has been halted for now — because of a lawsuit. But the commission does want to collect information already held by the federal government. “These are all sources of data that this commission needs to get,” said Hans von Spakovsky, a member of the commission and a senior fellow at the Heritage Foundation, the conservative think tank. Staff members were directed to follow up. None of the commission members offered evidence Wednesday of Americans conducting widespread voter fraud in the 2016 presidential election. But Gardner, the New Hampshire secretary of state, made the case that small-bore voter fraud can be just as significant. He said that he has presided over more than 500 recounts as the longest-serving secretary of state in the country. Gardner has disputed the claim that voters from Massachusetts or anywhere else rolled into New Hampshire and cast illegal ballots. Commission member Alan King, a probate judge in Alabama, said that he has seen only a single case of potential voter fraud in his time. In that instance, which he described to the panel, a father and son happened to have the same name — and the authorities were alerted. After looking into the matter, they declined to prosecute. He said the problem facing election officials is resources. “We have a huge challenge in this nation with keeping up with voting machine technology,” he said. The commission decided to collect information on that, too. States will be surveyed on the make, models, and years of their voting machines.